A number of AV Manufacturers at the CES conference in Las Vegas today, admitted to TechRadar that they are having trouble explaining just what BD-Live is to the average consumer. BD-Live or Profile 2.0 was launched at the beginning of 2008 and makes use of a Blu-ray players Ethernet connection. Although manufacturers were slow to adopt the format, companies like Panasonic, who announced at CES that its latest range of players are all Profile 2.0, have finally embraced the format. Just because Blu-ray player manufacturers have become savvy to BD-Live doesn't mean that the general public has, as Deborah Felicia of Panasonic explained to us. "Consumers are still very naïve about BD-Live, they are only just understanding Blu-ray," she said. "One of the main problems is that stores don't demo a Blu-ray player's BD-Live capabilities. They don't plug the machines into an Ethernet connection, to show the profile's full effect." 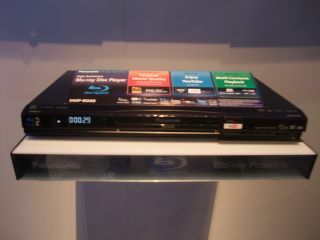 She did continue on a more positive not, however, admitting: "2009 will be the year that consumers will realise just what their Blu-ray players can do." LG agreed with what Panasonic felt about Profile 2.0, explaining: "When retailers properly explain just what BD-Live can do for the consumer, then they embrace BD-Live. It has to be demonstrated in-store, however, for consumers to realise its full potential." When we asked a spokesperson at Sony about Profile 2.0, he admitted their were some problems with consumers understanding just what BD-Live is about: "There's a lot of confusion, mainly because different movie distributors use BD-Live for different things. "For example, Warner did a time-sensitive director's commentary for The Dark Knight, which was great, but you had to know exactly when to go online to witness it. While other film studios use it for its social-networking and online chat capabilities. "Sony is doing some market research at the moment, to see just exactly how BD-Live can be explained in simple terms to consumers in the future."